In our house, I am always looking for the easy grab and go snack for my active family. As I have moved through this journey towards healthier eating for me and my family, I have been appalled at some of the ingredients listed on food boxes- especially foods marketed towards kids. 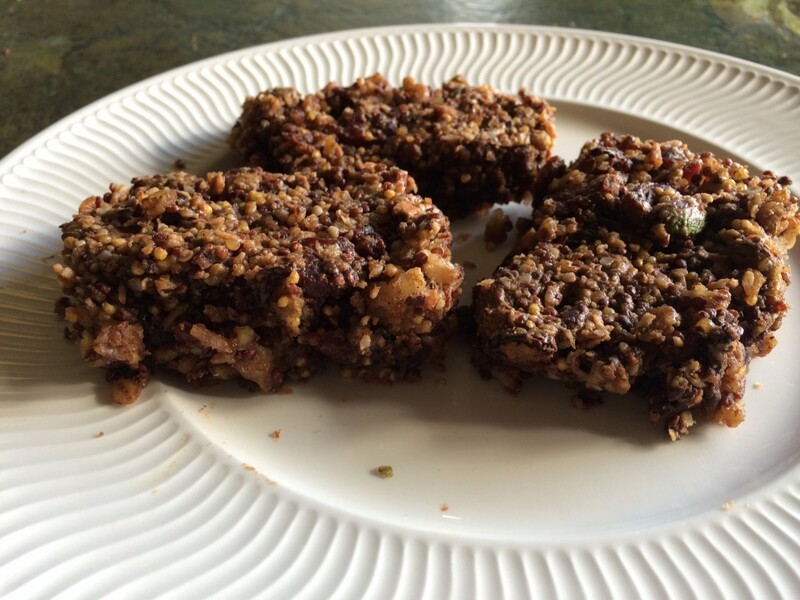 My kids love their snack bars so I like to try to develop recipes that appeal to their desire for a bar but without all the extra “special” ingredients of commercial bars. With these Dark Chocolate Cherry Snack Bars, I think I have scored a winner. They are crunchy, chewy, chocolaty, nutty mounds of goodness with tons of healthy omega-3′s, protein and other vitamins and minerals. And best of all they have no “mystery” ingredients that you need a science degree to pronounce! In this bar, I have used both quinoa, a seed most people are familiar with and millet, a grain most people aren’t familiar with eating. 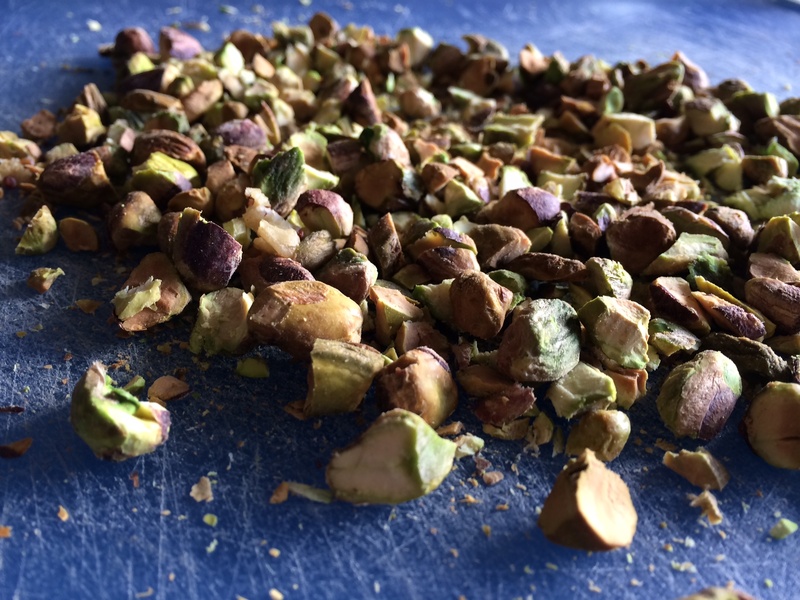 (Even though people in Europe have been eating it for centuries, most Americans will only recognize it as one of the ingredients in bird seed.) I like to add millet to baked goods because it is a gluten free, high protein, high fiber grain that adds a little crunch to whatever I am whipping up. Millet is high in amino acids, B-complex vitamins including niacin, folate, thiamine, and riboflavin, and is high in iron, magnesium, phosphorus, manganese, and potassium. It also is a good source of calcium and zinc. However, if the thought of eating “bird food” makes you squeamish or can’t find millet, you can replace it with quinoa or another of your favorite grains. Oat mixture before the almond butter. Oat mixture combined with the almond butter mixture. 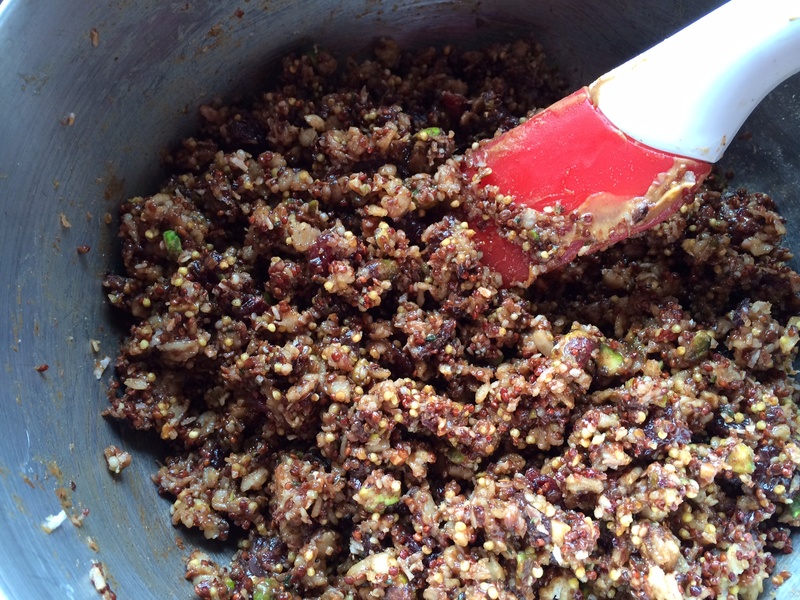 Soak oats, quinoa and millet for at least 6 hours but preferably overnight- (if you are going to soak). 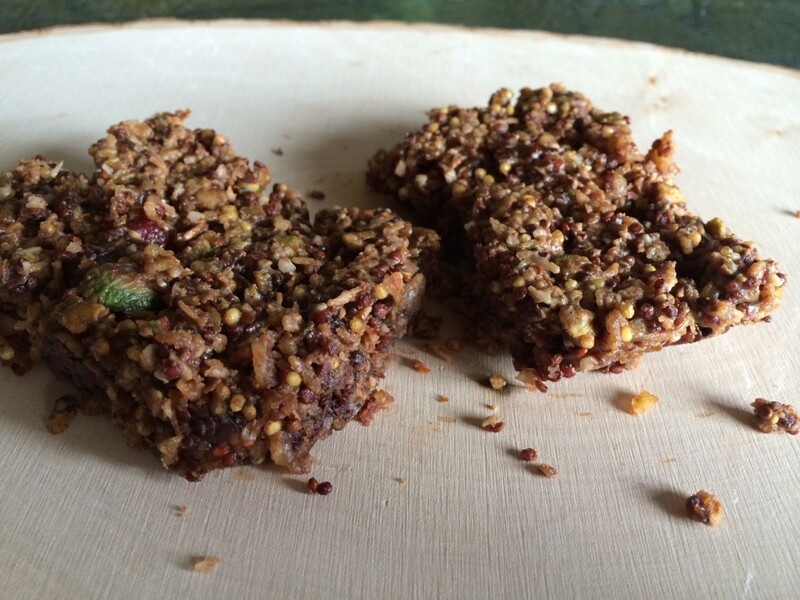 Drain oats, quinoa and millet and then spread on a baking sheet. Bake at least 10 minutes but until lightly brown. Stir to break up any clumps that form. 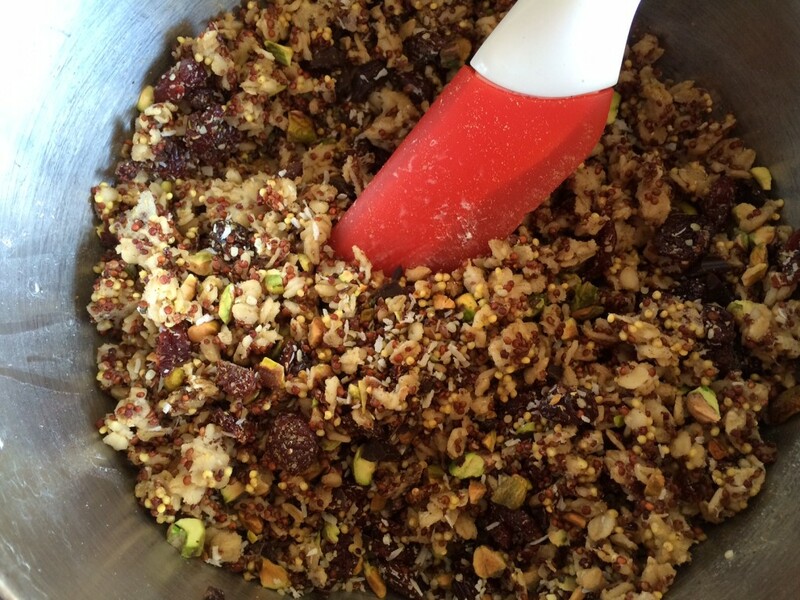 Place oat mixture in a large bowl and add the coconut, cherries, pistachios, flax meal, chocolate and hemp seeds. Combine the almond butter, coconut oil and maple syrup in a pot. Bring to a boil. Stirring constantly. Pour almond mixture over the oat mixture. Stir to combine. Press mixture into an 8x8 pan greased with coconut oil. Bake for 13 minutes or until lightly brown. This post is part of a link-up party on Tip Junkie.